Catalog Page 51. Large personalized teddy bears for sale. Catalog Page 51. Large personalized teddy bears with embroidered eyes for sale. Order large sized plush animals including huge teddy bears with personalized t-shirts and accessories. The large teddy bears are available in white, light brown and dark brown colors. You can mix and match the teddy bear colors or t-shirt colors as needed for no additional charge. These are tall bears measuring 18", 24", 36" and 44". We also offer much larger stuffed animals and teddy bears that are not featured in our online catalog. Send us an email and request images of the super large stuffed animals we offer. The Footsie Bears have embroidered eyes and embroidered paws on the bottom. Choose from white, brown and panda colors. Pricing includes the one-color printed t-shirt. In addition to bears with T-Shirts, we also offer printed accessories including hats, scarves and ribbons. If you order more that 2,000 pieces, we can custom manufacture embroidered teddy bears or stuffed animals, instead of using a T-Shirt. We have over 30 years of experience manufacturing stuffed animals. Send us your design today. Big promotional dogs. 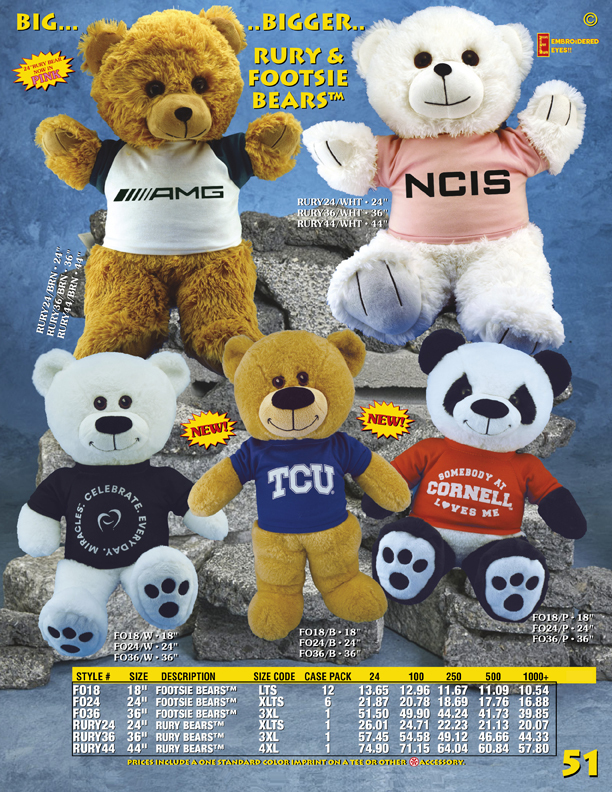 Huge plush toys with printed ribbon and T-Shirts. Large stuffed animals with printed shirts and banners. Customized tall teddy bears. Order large teddy bears with personalized t-shirts. Big size teddy bears for sale. China teddy bear manufacturer. Custom plush toys and OEM manufacturing.